Exquizon GP12 projector has a native resolution of 800*480 pixels as well as 1200lumens, which is suitable for home cinema. The projection size is up to 120 inches, giant screen movie viewing is a piece of art, your satisfaction is guaranteed with the best performance and reasonable price. 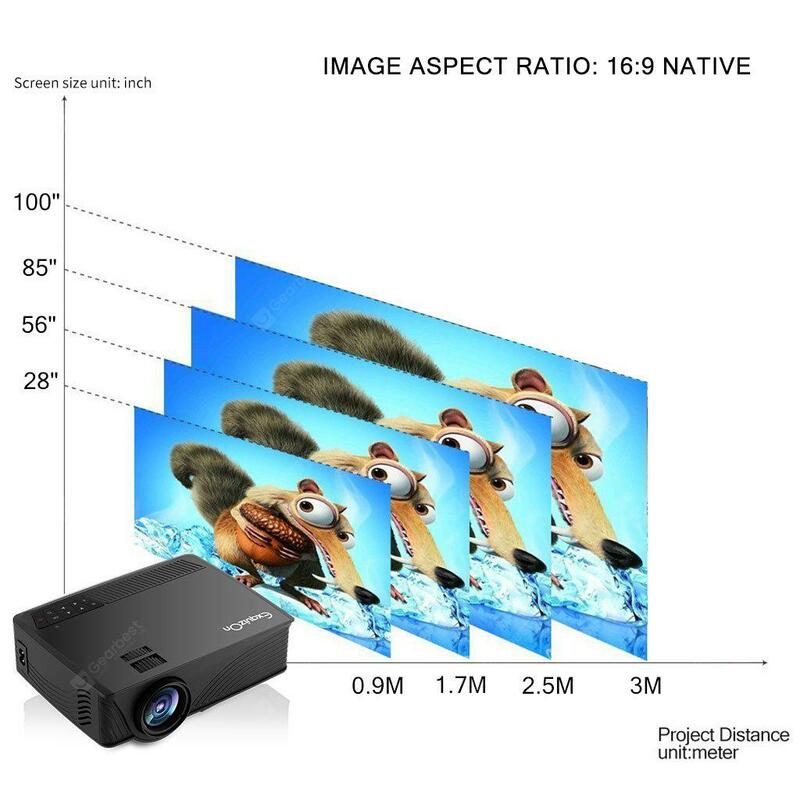 At the same time, the minimum projection distance is only 0.9 meter, you can enjoy the movies or photos in ultra short distance. Whether you’re watching a movie or a football game, the Mini Projector provides a big-screen experience from the comfort of your home.This mini projector projects a clear image without inflicting the same optical harm as TVs, laptops, and tablets. This technology protect your eyes without radiation while still allowing you to enjoy movies, sports, TV.Its light source is durable LED light with the working time of 20000 hours, which is low-noised and energy-saving. It has a exquisite design while its quality is also Its weight is only just 0.96kg, which is convenient and portable. For its high quality and various wonderful function a, it is exactly a wise choice for home theater. Just do not hesitate to own one! ?1?.Q:Can I connect my phone with it? A:Yes, you can. If you want to connect the projector with iphone or ipad, you need an original Apple AV composite cable (Lightning Digital AV Adapter) to connect them.While if you want to connect the projector with android phone, you need a MHL cable to connect them and the phone must support the MHL Agreement, please do not forget to choose HDMI source. ?2?.Q:Does it play 3D videos and and which type of 3D supports? A:This projector just supports the red-blue 3D, you should download the red-blue 3D sources and with red-blue 3D glasses. -3? Q:The picture on the screen is not clear? d) If you want to connect the computer, please make the resolution of the computer monitor as the same as the projector.